We perform all STAR Certified and Regular Smog Check Inspections required by the DMV. 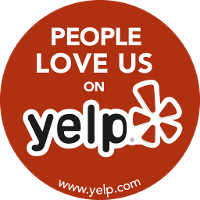 Serving Van Nuys, North Hollywood, Sherman Oaks, Studio City, Valley Village, Encino, North Hills, Panorama City, Reseda, Tarzana, Canoga Park, Chatsworth, and Mission Hills. The tech was very courteous and friendly I was in and out in about 15 minutes. Mention Yelp and he will take of 10 bucks off the regular smog check price." - Juilo O., Van Nuys CA "The smog check only took 10 minutes. I was in and out before I could finish my coffee. Price was reasonable as well, they honored my smog check coupon." Smog Check Pros uses the latest, most accurate smog check equipment to test you vehicle. We can certify for all smog check inspections required by the DMV: Star smog check, regular smog check inspection, gold shield, gross polluters, out of state registrations, and DMV renewals. At Smog Check Pros, we offer our customers honesty, integrity, efficiency and a clean facility located in the heart of Van Nuys, in Los Angeles for your convenience. While waiting, customers have to opportunity to surf the web with our free Wi-Fi, or stroll to nearby shops and restaurants along Sherman Way and Sepulveda to have lunch/dinner, coffee, or go shopping. Get a fast and accurate smog test that meets DMV standards when you come to Smog Check Pros. 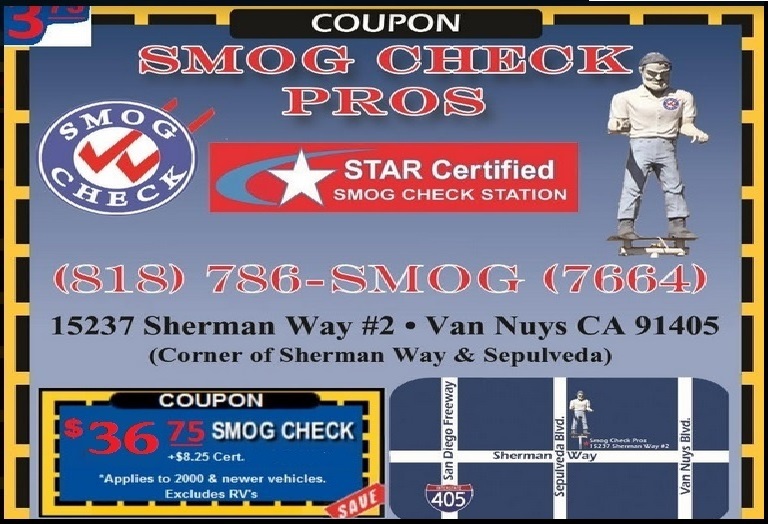 We use the STAR Smog Check Program to ensure a proper and thorough inspection of your vehicle every time. Take advantage of our smog check coupon to save even more when it's time to have your vehicle inspected again. With over a decade of experience in our community, our knowledgable staff and clean facility is here to help you pass your smog check inspection. Our team is continuously educated on any changes to state regulations and technology, so you always recieve honest and accurate smog check results. We are dedicated to building a reputation in the community for professionalism, and we are saving drivers money every day with our smog check coupons. "Quick, honest, smog check at the best price." Mon, Thur, Fri, Sat, 8:30 a.m.–6:00 p.m. Tues, Wed, 8:30 a.m.-4:00 p.m.